Pigeon Speaks: When you feel the heat, breathe. Let’s fly: Breathing/Pranayama- Pranayama in its most basic aspect is “restraining the breath” or a type of “breathing technique.” It allows one to develop the ability to expand prana or vital force. Prana translates into the word “air” but carries a much heavier connotation. *Prana is the vital power which is the force motivating the energy element of the earth and which is the origin of the force of thought. Basically, breath controls thought and that affects our reality. 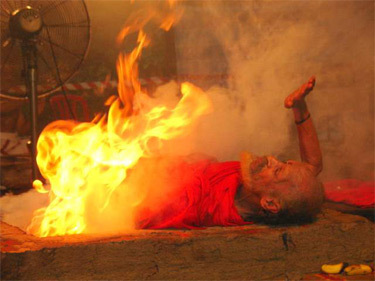 In this video, Yogi Rambhauswami, demonstrates that he can lay with fire and not die. He controls his breathing which calms his mind and allows him to (as he puts it) “become linked and unified with the magnified fire.” It’s a great lesson: if you can control your breathing you can control your mind and unite with fire; therefore, you can unite with and control fire. I’m not trying to tell you to go set yourself on fire. Just to think about what fire can represent. Fire, like many other things in life, can cause harm to the body and the mind. In order to overcome fire we must control and quiet the mind. Pranayama provides an opportunity to procure this ability. The intention behind your pranayama is conscious throughout the duration of the practice. You are focused on your breathing. This allows you to be drawn into the present moment to help silent the mental chatter that fills the spaces of your day. With practice you may find a decrease in stress and also new ways to deal with the unexpected in ways that don’t burn you. -Know your body. Make sure you are healthy enough to practice this; if you don’t know- ASK YOUR DOCTOR. *Dr. R. Senthil Kumar Ph.D Advanced Level Yoga. 2008.